Eight years ago, silver reached $48 per ounce. COMEX changed the margin requirements, and others dumped thousands of paper contracts on the COMEX market to smash prices lower. They succeeded, as usual. Gold and silver prices fell hard since their 2011 highs, while central banks levitated the S&P 500 Index, most stocks, and bonds with massive infusions of cheap debt. Central banks also purchased stocks and bonds. Inexpensive debt, QE, and bond monetization were good for the DOW and S&P 500 stocks. Central banks are reluctant to change policies, but the world may have arrived at another “Peak Debt” moment similar to 2008. What are prospects for silver and gold in the next several years? What data backs up the prognosis? Over the long term, nominal prices for stocks, commodities, crude oil, gold and silver rise. The primary driver is currency unit devaluation. That new Ford truck which cost $2,500 fifty years ago now costs $50,000. The dollar of 1913 is now a mini-dollar in purchasing power. Besides the exponential trend for higher prices based on devaluation of the currency, prices fluctuate based on confidence, news, and investor preferences. Hedge funds and bank interventions also distort prices. Central banks want continual devaluation, modest inflation, and low gold and silver prices. 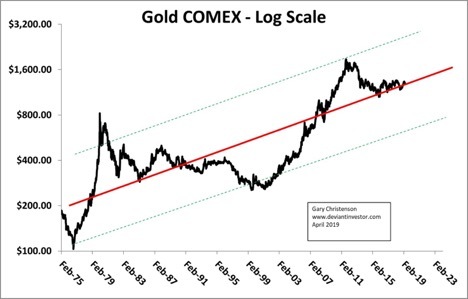 They do NOT want gold prices spiking higher as in 1979, 1980 and 2011 because those erratic gold prices demonstrate central bank failure to manage the slow devaluation of the currency. 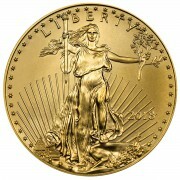 In broad terms, gold and silver often move down or remain flat as stock markets rise, and vice versa. President Nixon severed the dollar’s last link to gold in 1971. In 48 years, the S&P 500 Index, gold and silver rose exponentially. Examine their charts based on weekly data. 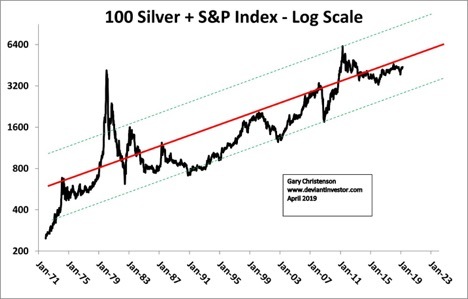 Because silver often moves opposite to the S&P 500 index, the sum of silver (times 100) and the S&P creates a narrower exponential channel. Silver, gold and the S&P 500 Index rise exponentially, mostly within trend channels. The sum of silver & S&P shows their exponential rise, which results from the dollar’s exponential loss of purchasing power. 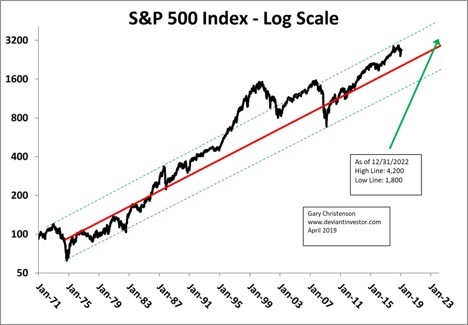 Until financial systems reset, expect this 48-year trend to continue. Gold, silver, and the S&P will rise and fall but, on average, their prices will increase along with consumer prices and dollar devaluation. The Big Question: Where are the markets now and what can we expect? Silver and gold fell or remained flat for eight years. The stock market has risen for over ten years, a long time for stocks. Retail apocalypse, declining sales and stores closing. Excessive individual and corporate debt. Weaker auto and house sales etc. James Sinclair, among others, thinks the party will soon be over. He suggests mid-2019. We are a few months away. If the party is over, and if conditions reverse this year, the stock market could fall while gold and silver spike higher. 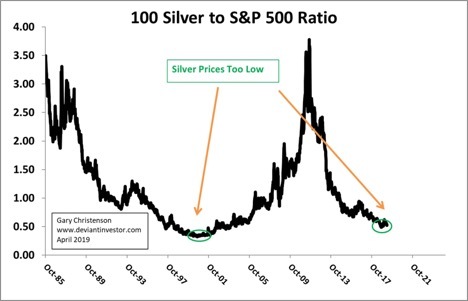 What does the silver to S&P 500 ratio show? Silver prices are too low compared to the S&P 500 index, as they were 18 years ago before silver rallied from $4 to nearly $50. Bet on flat to lower S&P 500 Index and much higher silver prices during the next five years. 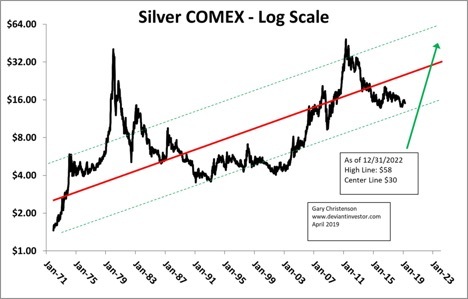 The five-decade graph of silver shows it could rise to $58 by the end of 2022 and remain within its long-term channel. This is not a prediction, but it suggests higher prices are possible… and inevitable. Silver often overshoots trend lines and might spike far higher than $58. Will silver reach $100 by the end of next decade? Will congress continue deficit spending? Will the national debt rise nearly 9% per year as it has for many decades? 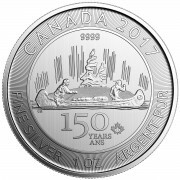 Will those newly “printed” currency units from massive debt creation boost prices for silver and gold? Will the mini-dollar morph into a micro-dollar? 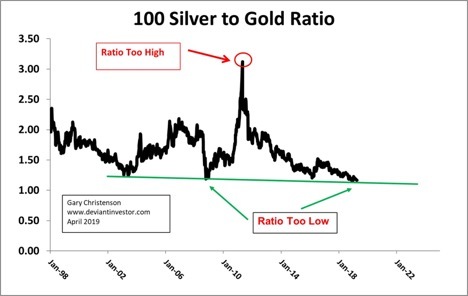 Examine the weekly silver to gold ratio chart. It shows that silver is undervalued compared to gold. When worries arise about national and corporate insolvency, loss of confidence, a credit crunch, hyper-inflation, or a currency crisis, silver will spike higher. The dollar devalues and stocks, gold and silver rise exponentially in nominal prices. Prices for silver and gold are inexpensive in 2019 compared to the S&P 500 Index. That will change. 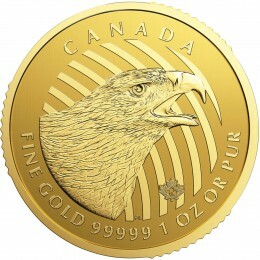 Prices for silver are inexpensive compared to gold. That will change. Timing is unclear, but 2019 and 2020 appear to be transition years for many markets. Central banks, the banking cartel and governments prefer rising stocks and bonds, lower interest rates, and weak metals prices. That will change as central banks lose control of debt creation, inflation and the economy. 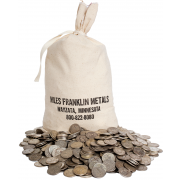 Miles Franklin (1-800-822-8080) will recycle debt-based fiat dollars and convert them to silver and gold. China and Russia purchased large quantities of gold because they prefer gold to devaluing dollars. Central banks are buying gold. Follow what they do, not what they say. This latest shake out looks like it’s meant to be scare everybody but the Banks, who know better. BUY LOW!